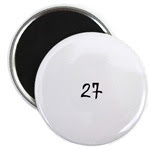 Along with some other Harmless Stuff, check out the "authentic" 27 merchandise! Magnets, shirts and mugs... oh my! View it all at my store... Harmless Stuff : CafePress.com!